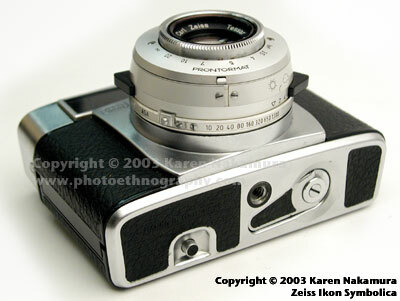 The Zeiss Ikon Symbolica is a simplified point-and-shoot made by the Zeiss Ikon corporation around 1959. It features scale focusing (none of that complex rangefinder nonsense) as well as simplified "program" match-needle metering. Using the text or images on this website without permission on an ebay auction or any other site is a violation of federal law. You just twist the single combined shutter-speed-aperture dial until the metering needle reads in the middle and snap away. Klauss-Eckard Riess quips that the Zeiss foreman on seeing this camera nicknamed it the "Idiotica." One of the areas that they didn't cut corners was the rewind knob, which pops out of the bottom of the camera. It's very cute and very well made. The inside the of camera is very solid. The lens is a solid Tessar, which doesn't have to apologize for anything. I'm not exactly sure how the light meter works. You set the ASA on the bottom of the shutter, as you can see, but I'm not sure how that works. My unit might have a loose dial. There's no rangefinder, you scale or zone focus using the "symbols" (head-n-shoulders, family, mountains), which is what gave this camera its name. Despite its simplified design, the construction is anything but simple. It's a heavy and well-built unit. 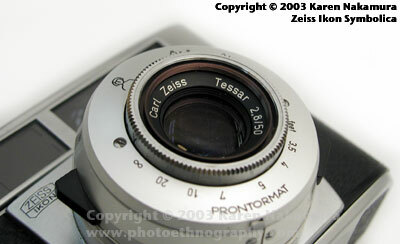 It features a Zeiss Tessar lens, which is renowned for its sharpness and contrast. That was Zeiss' downfall. They tended to overdesign everything. As the world moved into the 1960s and towards cheaper and cheaper cameras (Instamatics, etc. ), the market for Zeiss' heavy metal-chrome cameras fell away. Although the 50mm f/2.8 Symbolicas are fairly common, there was an earlier and much rarer 45mm f/2.8 Symbolica. While the top plate of the later model is flat, the early model has a stepped top plate. Use of this chart, text, or any photographs in an eBay auction without permission will result in an immediate IP violation claim with eBay VeRO. Violators may have their eBay account cancelled. 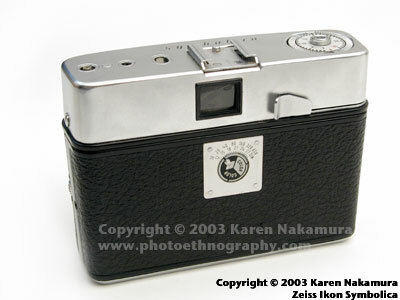 Zeiss Ikon was formed in 1926 out of the merger of five companies: Carl Zeiss/Jena A.G., ICA A.G., Erneman A.G., Goerz A.G, and Contessa-Nettel A.G.
Zeiss-Ikon was a huge corporation with offices in five cities in Germany and it offered a huge variety of cameras. Unfortunately, that was also its downfall. Various divisions competed against each other horribly and there was much, much reduplication of effort. It never really took advantage of its size. Carl Zeiss, the main company, can actually trace its roots to 1846, to the very dawn of photography and is renowned for such designs as the Tessar and T* coating. Even now, Carl Zeiss lenses grace the very best cameras from Contax to Hasselblad. 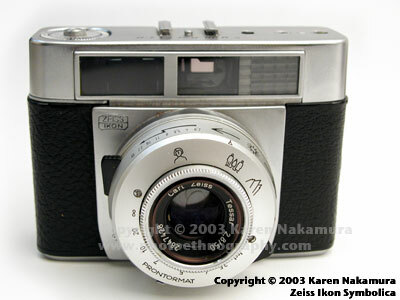 In 1972, Zeiss formed into a partnership with Yashica Corporation of Japan. Zeiss now only does lens design and makes a small amount of photographic lenses. 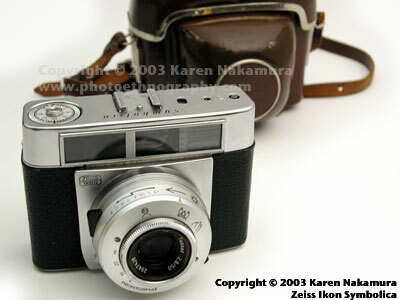 Yashica manufactures the Contax series of Zeiss cameras. Last modified: Thursday, 11-Mar-2010 01:14:55 EST , [an error occurred while processing this directive] .